Recovery Unplugged Treatment Centers is being featured in USA Today's Addiction and Mental Health Awareness issue on Thursday, September 13th. 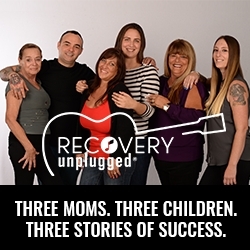 The "Three Stories" multimedia campaign created by Recovery Unplugged highlights the stories of three mothers and their children who have made it to the other side of addiction - together. Fort Lauderdale, FL, September 08, 2018 --(PR.com)-- Recovery Unplugged Treatment Centers is pleased to announce that they will be featured in USA Today’s upcoming Addiction and Mental Health Awareness Issue. The organization will be featured for their inspiring and innovative “Three Stories” campaign, a multimedia marketing effort that tells the stories of three mothers who helped their children, all current Recovery Unplugged staff members, overcome addiction and take their lives back from drugs and alcohol. The stories in this campaign serve as an illuminating and inspirational reminder of the incredible power of family, and a must-read for any parent, loved one or friend of someone struggling with substance use disorder. Last year over 72,000 people died from drug overdose and Recovery Unplugged wants to remind families, communities and loved ones of vulnerable SUD sufferers that they have the power to affect change. USA Today’s Addiction and Mental Health Awareness Issue will be released on Thursday, September 13th. For more information on the campaign and Recovery Unplugged, contact Vicki Quintero at vickiq@recoveryunplugged.com. Recovery Unplugged is a national addiction treatment organization, and the only addiction care provider to fully integrate music into our rehab programs. Combining traditional treatment resources like medical detox, comprehensive behavioral rehab and aftercare with innovative and effective music-based therapies, Recovery Unplugged offers clients an effective, unique and music-focused treatment experience. Our world-class doctors, therapists and creative professionals leverage the power of music to help our clients heal from drugs and alcohol and reclaim their lives from addiction. This music-based treatment approach has helped clients from all over the country access their confidence, break down emotional barriers and overcome their addictions.